A hidden wire, buried underground, carries the harmless, low level FM radio signal around the containment area. Your dog wears a receiver on his collar that detects the signal and activates the receiver if your dog gets too close to the hidden wire. When activated, the receiver emits a mild stimulation (also called a ‘correction’) when he gets too close to the boundary. Using our PetFriendly™ Training approach, we train your pet to recognize the containment area through voice commands, audible warning signals from the receiver collar and visual flags that are set inside the hidden fence. We also show you how to reinforce the training, which you will need to do for a few minutes each day for about two weeks. Your Dealer will develop a plan to meet the specific training needs of your pet(s). With training, the dog remembers the placement of the flags and is taught to stay within the containment area. During the training period, flags are slowly taken away. If your dog gets too close to the boundary, he’ll hear a warning sound (or feel a vibration) that alerts him to stop. If the dog continues beyond the warning zone, he will receive a mild correction. After training, most dogs stop before receiving the correction. How is DogWatch® different from Wireless Fence® and other brands? DogWatch is the only hidden fence system that uses a digital FM radio frequency. Other pet containment systems such as Wireless Fence® use a digital AM radio frequency which is more susceptible to unsecure (stray) AM signals that can cause false corrections even when your pet is not near the underground fence. The FM signal used by DogWatch is the most secure and safest for your pet. Most of our receivers have a two-year battery life — an average of eight times longer than the other brands, including the Wireless Fence® brand. When the battery runs out, guess who else runs out? Our long battery life helps keep your pet safe, costs a fraction of what you pay for other pet containment systems, and is good for the environment. 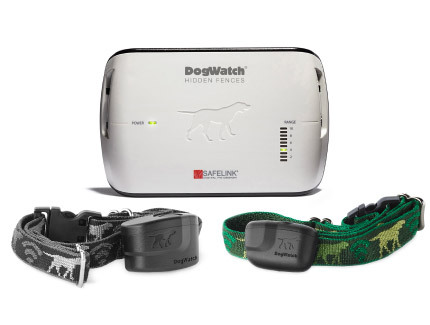 In addition to low battery replacement costs compared to Wireless Fence® and other brands, you also save with DogWatch because you can purchase batteries for the DogWatch system from any source and you do not need a service call from a Dealer to replace them as is required by most other brands. For your convenience, we have an optional battery replacement plan to ensue you always have a new battery when you need it. Our R7 and R9 receiver collars have a status light that is easy to view and a great convenience feature for our customers. It lets you know if the receiver is operating properly, indicates what training level you’re using and when the battery power is low. DogWatch includes a unique feature that allows you to correct your dog with an audible-only reminder when he approaches the electric fence. Wireless Fence® does not offer this PetFriendly™ feature. You can adjust our patented, programmable receiver to the training level that works best for your pet’s personality and size. No need for a service call or any other charges. Our R7 and R9 receivers have our exclusive AutoMemory® The receiver constantly monitors and automatically adjusts the training level for your dog if he “challenges” his boundary. DogWatch receivers feature FastReact® — the fastest response time in the industry. At .125 of a second, if your pet tests the hidden fence the receiver will react immediately, at the beginning of the avoidance zone — not when your dog is half way through. This feature helps ensure your pet responds to the hidden dog fence while still INSIDE the containment area. Our PetFriendly™ audible-only training level allows you to train your dog using an audible “beep” tone before you introduce him to the correction setting. Once trained, most dogs respond to the audible warning tone and do not test the boundary. Your DogWatch Hidden Fence has a lifetime equipment warranty when installed by an authorized DogWatch Dealer. DogWatch provides superior technology and products to keep your pets safe and contained. We have the most advanced technology . . . and it is the easiest to use. Additionally, we are and independently owned local business. We live and work in our community. Customer satisfaction and referrals are very important to the success of our business, so we work hard to provide you with courteous and prompt customer service. Will DogWatch work for my cat (or other pets)? If you experience frequent power loss, we can add a DogWatch PowerPak. This auxiliary power supply provides hours of power to your electronic fence until your household electrical service can be restored. DogWatch Hidden Fencing usually costs much less to install and maintain than traditional dog fencing, and it can do far more. For example, you can contain your dog in your yard, but keep him out of a pool area, garden or driveway gate. Contact Us for an estimate on your individual property. Our systems work in small urban yards and 200 acre orchards and everything in between. DogWatch offers models that can cover properties up to 200 acres and all types of terrain, including water. You can contain your dog in or out of most anywhere, including interior features of your home such as couches, dining rooms, and counter tops. Contact Us today for a free consultation and estimate. All dogs are different. Even within the same breed some dogs may mature earlier than others. When we meet with you and your pet, we will evaluate your dog and make a recommendation as to when training should begin. No. This type of stimulation has been used in dog training for over 40 years. The amount of correction is set only to the level needed to deter the dog from crossing the boundary. For most dogs, this is a relatively low level and is more like a static shock when you walk across a carpet in your socks. It does not physically harm you, but it gets your attention and you usually try to avoid getting another shock. Most dogs adapt quickly and happily to the hidden fence. DogWatch products are used and recommended by veterinarians. You can take your DogWatch system with you! You may need to have new wire installed at the new house, but we can use your existing equipment to create your new hidden fence. We’ve been surrounding pets with freedom since 1990 and we offer the only pet containment fence that uses an FM signal to protect your pet from the random corrections that sometimes happen with other systems. We’re a privately-owned, people and pet-oriented company that takes pride in our quality customer service. Our engineers constantly research and develop new ways to make our products the safest for your pet and the easiest for you to use in your home. We strive to create the best pet containment products in the industry. Our experienced, friendly staff is here to answer any questions you might have about your DogWatch product. Give us a call or send us an email to request more information or to set up an appointment.